Gun Crazy opens with the committal of a crime. 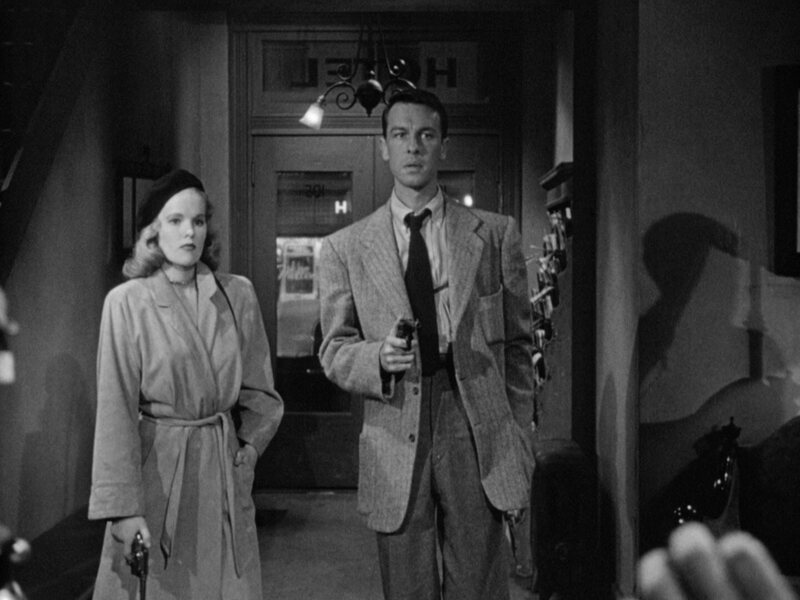 This comes as little surprise; Gun Crazy is, after all, a film noir. However, we're not talking about a crime that would quickly ensnare a hapless protagonist. It doesn't truly presage the dark path down which our central character would soon walk. This burglary, committed by a teenage boy, is instead used in a lengthy courtroom sequence and a series of flashbacks to establish two key points. The first is that Bart Tare, true to the film's title, is wholly and completely obsessed with firearms. That compulsion is why he couldn't resist the urge to smash open a hardware store window to swipe a revolver, replacing the one he'd made the mistake of bringing to school. Second, and no less significant, is that Bart cannot kill. He's as talented a sharpshooter as they come, despite his tender years, but nothing living will ever again find itself in his crosshairs. These two characteristics continue to define Bart: through reform school, through a stint teaching sharpshooting in the Army, and, hopefully, through the next chapter of his life, perhaps in a career performing shooting demonstrations for a weapons manufacturer like Remington. 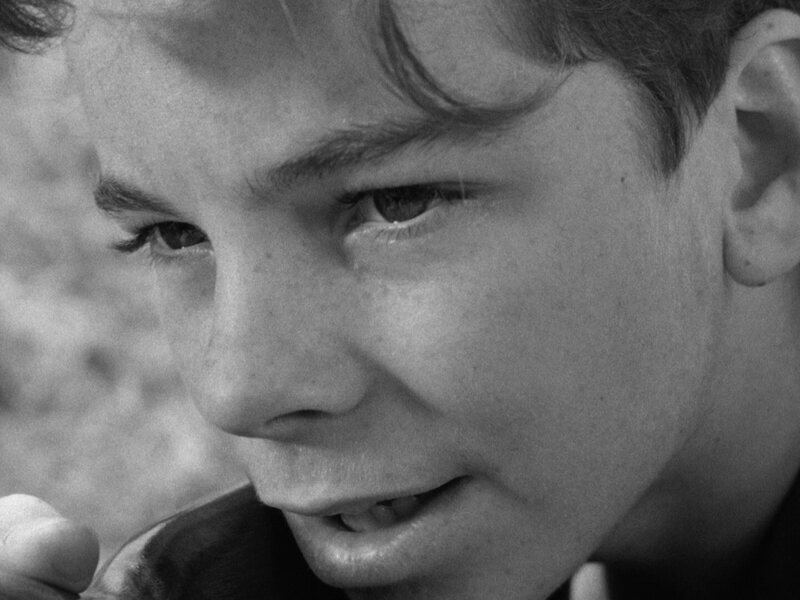 Amiable and as well-adjusted as possible given his singular obsession, all indications are that Bart (played as an adult by Rope's John Dall) has seen his life of crime begin and end with that one youthful lapse in judgment. ...and then he meets Laurie (Curse of the Demon's Peggy Cummins). Cute as a button in her cowgirl costume, Laurie at first blush looks to be worlds removed from the sultry, smoky femmes fatale so often associated with noir. That is, until she quite literally aims her sights towards Bart mere seconds later. 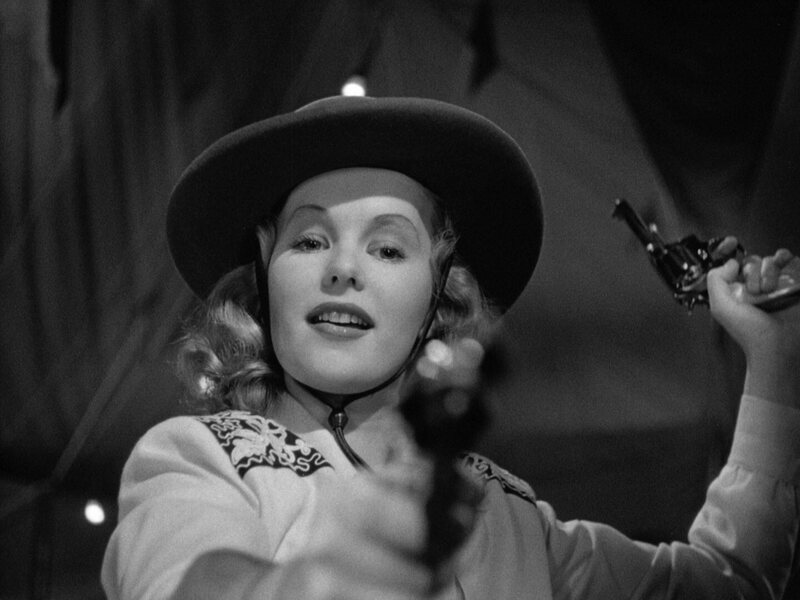 Laurie capitalizes on her own prowess with a revolver as a carnival sharpshooter, and part of her act is to sucker rubes from the audience into a shooting competition. This entire sequence crackles with sexual energy; as Glenn Erickson states in his audio commentary, it's practically foreplay. Despite Laurie's attempts to distract him with suggestive poses in her entirely too tight costume, Bart wins the competition. He's not on top for long. Bart joins up with the carnival as well, traveling the country and ekeing out some kind of living as a sharpshooter, with an impossibly gorgeous woman by his side all the while. This is the life of which Bart had long dreamt. Laurie, however, aches for more. Money. Luxury. Adventure. She's never going to find that on a carnie's salary, and Bart is too infatuated to continue saying "no" to the life of crime that she relentlessly cooes in his ear. Carnival sharpshooters turned stickup artists: what an irresistible premise, especially when executed so masterfully by director Joseph H. Lewis (The Big Combo) and cinematographer Russell Harlan (Blackboard Jungle; To Kill a Mockingbird). Diverging from the shadowy, urban backdrops most often associated with noir, Gun Crazy is instead largely set in backwater towns. The robberies overwhelmingly take place under the light of day. It's intriguing that Laurie isn't merely the seductive catalyst for Bart treading a dark path, as femmes fatale so often are; she's the aggressor and unwaveringly by his side. Where Bart is collected and can't bring himself to take a killing shot (literal and figurative impotence), Laurie is prone to panic and willing to gun down anyone or anything she perceives to be a threat. They are in every way partners in crime. This spree of stickups isn't a means to an end for her; the thrill of making someone cower at gunpoint is as essential as whatever ill-gotten gains they dash away with. To his part, Bart holds no illusions about where this will lead. They can no longer turn to friends or family. They'll never be able to settle down...not in this country, anyway. Still, he can't imagine a life without Laurie, and this is the cost. The tragedy is that inevitability, and only he sees it. The allure of Gun Crazy extends beyond this dark descent: its raw energy, its brazen sexuality, its technical brilliance. Among the standout sequences is a bank robbery executed in a single, unbroken shot, photographed guerilla-style in the center of a sleepy town with largely improvised dialogue. Nearly as impressive is an intricately planned payroll heist at a meat-packing plant where the point of no return is inexorably crossed. Some viewers may be disappointed by the extensive psychological groundwork throughout the first act, but the remainder of the film boasts no shortage of action. There is, naturally, the gunplay you'd expect from a film titled Gun Crazy, as well as quite a few car chases, many of which are photographed such that the viewer is more accomplice than onlooker. 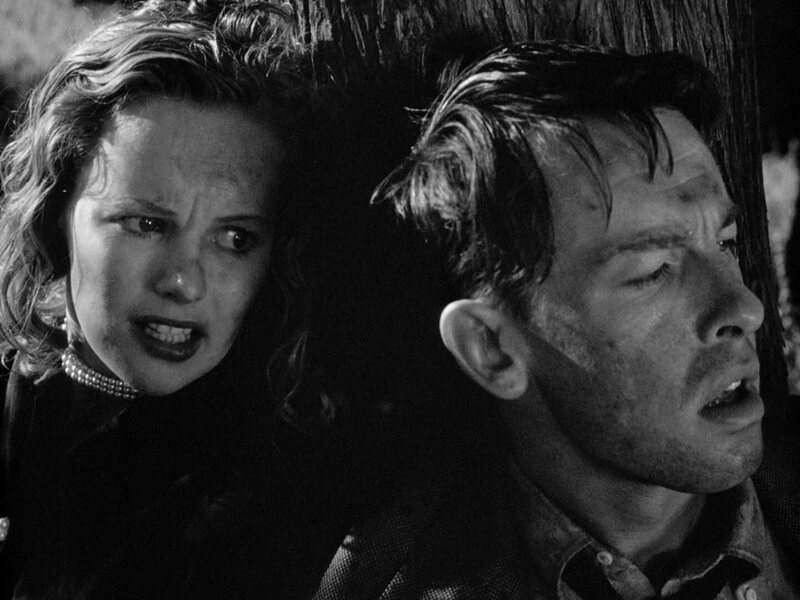 Gun Crazy left little perceptible impact on the box office in 1950 but over time proved to be wildly influential, from Godard's Breathless to the revolutionary Bonnie and Clyde. It's a thrill to have such a seminal noir at long last find its way to Blu-ray, especially one with such an outstanding presentation and a compelling selection of extras. Highly Recommended. 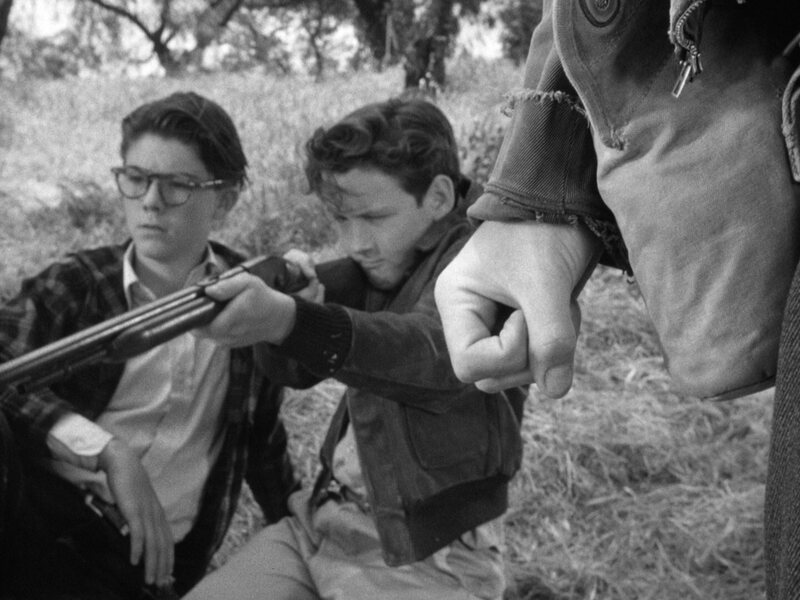 Its fine, filmic sheen, the sense that I could practically discern each individual strand of Bart's hair, the impressively resolved texture of the young boy's jacket – Gun Crazy is in very much the same league as the other achingly gorgeous films noir that Warner Archive has brought to Blu-ray. 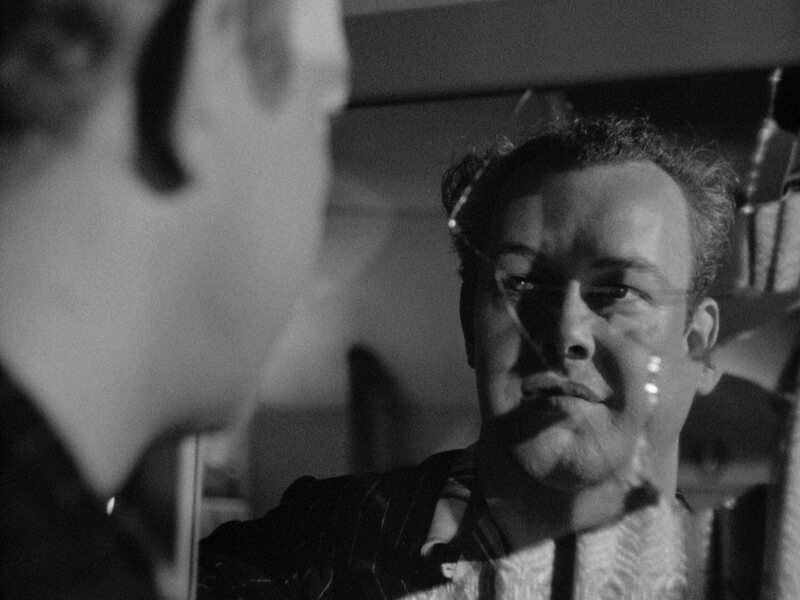 That this isn't a 4K remaster in the same vein as, say, Key Largo is noticeable but largely insignificant. Detail and clarity consistently dazzle, with the usual caveat about generation loss in process shots. No wear or damage of any sort are to be found throughout. Gun Crazy has been authored with a sufficiently high bitrate to ensure that its film grain is reproduced without any concerns. At no point does the noise reduction reportedly visible throughout Wild Side's French release threaten to intrude. Even in exceptionally dark shots, shadow detail remains robust rather than washed away in a sea of black. 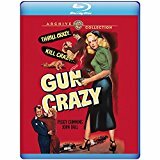 Gun Crazy has been a long time coming to Blu-ray on these shores, but a release this impressive proves to be worth the wait. Gun Crazy and its extras span both layers of this BD-50 disc. The film is, of course, presented on Blu-ray at its theatrical aspect ratio of 1.37:1. Presented in two-channel mono, Gun Crazy's 24-bit DTS-HD Master Audio soundtrack similarly leaves little room for complaint. Dialogue is consistently reproduced well throughout, with every last syllable effortlessly intelligible and rendered clearly. Victor Young's score as well as the cracks of gunfire one would expect from a film with this title are reinforced by a reasonably throaty low-end. At no point is the soundtrack marred by any clipping, distortion, dropouts, intrusive background noise, or the like. The lossless audio is every way exceptional, just as I've come to expect from a Warner Archive release. The disc's audio commentary is lossless as well. Optional English subtitles (SDH) have also been provided. Audio Commentary: Glenn Erickson – DVD Talk's own DVD Savant! – offers both a historical perspective and his seasoned critical eye in this expectedly terrific commentary. Erickson speaks to which sequences were almost certainly filmed after principal photography had wrapped to appease the Production Code. Also discussed is the significant influence that Gun Crazy had on both French New Wave cinema and New Hollywood years after its bungled theatrical release. Not having read the original short story beforehand, it's appreciated that Erickson takes such care to compare and contrast this adaptation with its source material. The detail with which Erickson analyzes two sequences in particular – the first encounter between Bart and Laurie at the carnival shooting contest as well as the bravura, documentary-style, heavily improvised bank robbery captured in a single, epic take – are alone worth the price of entry. He relishes in exploring the lives and filmographies of the talent on both sides of the camera, from character actors in small roles to the uncredited screenwriting by Dalton Trumbo. Gun Crazy's cinematography, score, costume design, and recurring visual motifs are among the many other topics of discussion. Film Noir: Bringing Darkness to Light (68 min. ; SD): This Blu-ray release also houses a feature-length documentary previously only available in the third volume of Warner's Film Noir Classics Collection on DVD. Glenn Erickson is again a contributor, alongside such storied cinematographers as Gordon Willis and Roger Deakins, filmmakers like Sydney Pollack and Edward Dmytryk, composer André Previn, fellow noir historian Eddie Muller, and actresses Audrey Totter and Jane Greer, among dozens of other notable names I already regret not listing in full. Bringing Darkness to Light is a primer on what it takes care to note is not a genre or subgenre of cinema. Noir is a style, and one whose definition proves elusive at that. The documentary explores the societal conditions that led to the rise of noir, the themes and visual motifs central to these films, and the freedom these movies so often enjoyed as a result of their low budgets. Also discussed are the visual style that first took root in Norwegian cinema, the way in which these films delight in playing with light and shadow, jumpy editing serving as a substitute for violence, their inventive use of music, how audiences found themselves unexpectedly rooting for a "knight in dirty armor", daring sexual dynamics, the psychological frailty so pervasive in noir, and the recent resurgence of a style that had all but ended with the rise of television. Numerous excepts from films noir – many of which are available on Blu-ray courtesy of Warner Archive – reinforce the consistently engaging discussion. Gun Crazy has been lavished with a Blu-ray release deserving of such a wildly influential film noir, boasting a spectacular presentation, a remarkable audio commentary, and a rewarding feature-length documentary. Very Highly Recommended.